When the weather turns a bit warmer and the stores start displaying green lovely asparagus I HAVE to make this salad. The recipe is incredibly simple and was inspired whilst shopping at Whole Foods for a dish to contribute to a family Easter dinner. While perusing the deli case for something pre-made I glimpsed this delicious looking salad! I scrutinized it and at $5.99/lb. I knew I could re-create it for far less. So I went about the store collecting all the items I thought might be in the dish. It turned out splendidly and was well received at our family gathering. Wash asparagus and trim ends, then cut to desired size. Wash and halve cherry tomatoes. Cut artichoke hearts into desired size and add to bowl. Heat olive oil in pan and warm the garlic until fragrant and soft. Drizzle over vegetables and gently toss. *When choosing asparagus, select firm, green spears with tight, crisp tips. I prefer thin asparagus as the thicker ones tend to come from older plants and can be tough. this looks so delicious !!!! This is a beautiful salad! 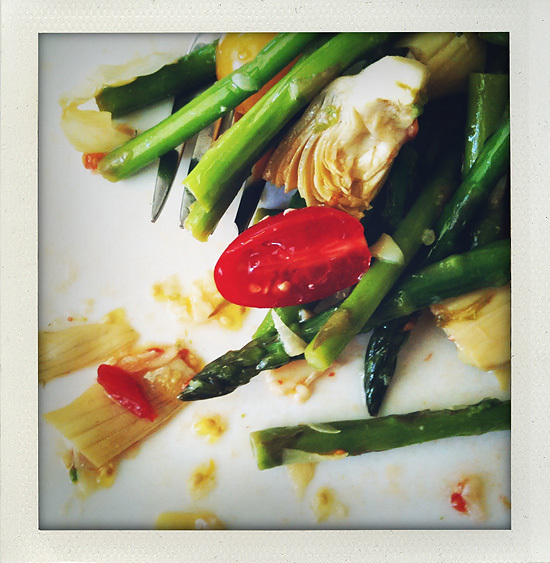 I am not fond of raw asparagus, though, do you think it would be OK to add blanched asparagus? I love thinking about the garlic flavored olive oil as the dressing! i am making this again tonight ! funny ... i was already planning to make it and then you reposted it !! only took me 5 months to amend! ha!